If you enjoy these cartoons, please support my patreon! A $1 pledge really means a lot. It’s pretty common to hear Americans – usually but not always conservatives – lament that life was better back then (whenever “then” was). Less common: Hearing this said by anyone who’s not white (or not male, or not straight, or not cis). Happy memories also need to be put in context. I have interviewed many white people who have fond memories of their lives in the 1950s and early 1960s. The ones who never cross-examined those memories to get at the complexities were the ones most hostile to the civil rights and the women’s movements, which they saw as destroying the harmonious world they remembered. But others could see that their own good experiences were in some ways dependent on unjust social arrangements, or on bad experiences for others. Some white people recognized that their happy memories of childhood included a black housekeeper who was always available to them because she couldn’t be available to her children. So this cartoon is about white nostalgia. When I wrote this, I was thinking of John Rawls, the philosopher who wrote “A Theory of Justice.” Rawls suggested (and I am WAY oversimplifying! My apologies, Rawls fans!) that one way to judge how just a society is, is to ask if people would choose to join that society if they stood a chance of being the least well-off member of that society. In the not so nutshelled form, this is called the veil of ignorance, and although I read Rawls in college mumble mumble years ago, it’s stuck with me ever since. A cartoon like this could have been done about any number of marginalized peoples – women, LGBT, disabled people, Latinx, and many more. I played around with different wording (“when you get there, you’ll be a disabled lesbian of color,” etc) to be more inclusive, but as is often the case, piling more details on a short cartoon seemed, to me, to make the cartoon hit less hard. Diversity is important to me, but diversity for me, as a cartoonist, may be best achieved by trying to do a variety of subjects over multiple cartoons. I went through a variety of wishing props when thinking of this cartoon. I rejected doing a genie because it’s hard to do a recognizable genie in just two panels without relying on racial stereotypes. I thought of doing a wishing fish, a reference to my third graphic novel. I thought of using the magic wish-granting fairy from an earlier cartoon. But in the end, I liked the idea of a magic wishing ball, because it’s just so out of nowhere. Plus it let me do the open “magic ball” box in the background, and I like imagining this dude just ordered his magic ball from Amazon. 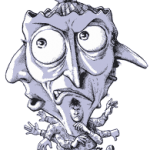 This cartoon has four panels, and is colored in various tones of sepia. A man stands alone in a room, holding out a shiny ball in one hand. He is speaking to the ball. Nearby, an open box with “Magic Ball” written on it lies open on the floor. The man is looking a little anxious, and is dressed in a slightly old-fashioned style, with a bow tie and a vest with thin vertical stripes. MAN: Oh, magic ball… I wish I lived in the old days. Society was better then. Life was better. MAGIC BALL: I, the Magic Ball, will grant your wish! The man continues speaking to the magic ball, now with an overjoyed expression. MAN: Wow, it works! Thank you, magic ball! It’s been my lifelong dream to live back when everything was civilized! 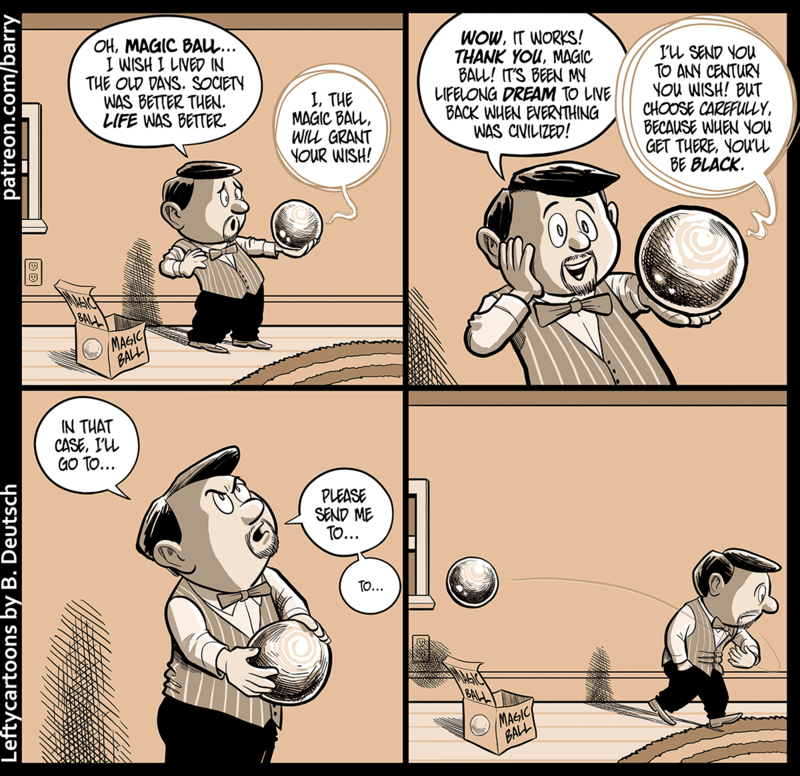 MAGIC BALL: I’ll send you to any century you wish! But choose carefully, because when you get there, you’ll be Black. Still holding the ball, the man looks up as he concentrates, his brow knitted. Dejected, the man walks away, tossing the ball away over one shoulder. Dude, you have a nice, spacious, quiet home and you speak English right here in the 21st century most civilized world? Trust me, you’re far better off right here where you are than you would “be” as King Henry VIII, King Louis XIV or anyone else in the past you’d care to name. Yeah dude, how powerful are you now? Power comes from within for the most part. So if you’re not already a highly skilled power seeker…you might get the power of a king/khan/czar/Roman emperor/etc, but you wouldn’t keep it. Obama got this one right. Right here, right now is the best off humanity has ever been. I think it’s self-evident that life for white Americans now is, on average, better than life for black Americans has ever been, so the narrow point of the cartoon stands. Also, I think it’s self evident that life for black Americans now is, on average, better on average than it was in any year up to, say, 1990. I think it’s probable, but not certain, that life for black Americans now is, on average, better than it was at any point between 1990 and, say, 2008, when Obama took power. I have no idea whether life for black Americans is, on average, better than it was 10 years ago; it wouldn’t surprise me at all if it was not. I don’t know what fraction of black Americans would take the magic ball up on its offer and pick the 21st century, but it wouldn’t surprise me if (modulo the obvious concerns about leaving your family and friends and so on) quite a lot would. I think that two obvious things that have a big impact on it – the economic situation of the poor and the amount of racism – improved pretty steadily for most of the last century, and I worry that both those improvements, and a bunch of others, may have slowed or stalled or even reversed. Another big driver of improvement of quality of life – technological and scientific progress – is definitely still going forward, but may be slowing. It’s too soon to tell noise from signal, and I hope I’m wrong, but put together all this is a worry – my general view of the history of the last 500 years is broadly whiggish, but I worry that that trend may be coming to an end. Everything that looks like exponential growth turns out to be the bottom half of a sigmoid, and perhaps the inflection point is coming in sight. My analysis is that racism is not increasing, but either still decreasing or stagnant, but that the situation for the lower and lower middle class is getting worse. Given that black people are disproportionately lower and lower middle class, they are more often impacted by this. So their improved circumstances due to the opportunities caused by less racism is dampened by a general malaise among the lower and lower middle class. These problems are then often falsely attributed to racism, which ironically enough then cause mutual resentment between black and white (with many of the former accusing the latter of holding them back, while many of the latter feeling that this is a false accusation). As for history being a sigmoid, it seems quite plausible that the agricultural and industrial revolutions were immensely disruptive and thereby allowed for a ton of low hanging fruit to be plucked. Before that time, economic and technological progress was slow. We may simply be returning to the mean. However, our system and expectations are largely based on rapid progress, which may cause a lot of friction. it would surprise me very much, because i think the world is better now and mostly keeps getting better. of course there are always some things which will get worse but overall it seems better. what do you think is worse? maybe you are looking at relative-better, like “inequality?” but that is not an issue of actual better. you can have a better life and also more inequality. I’m looking at, for example, the charts in this article, which show (roughly – it’s worth checking the details) that the average black American houseful has increased in income over the last few years, but decreased in wealth. I’m not sure which matters more. I also have a vague memory of some surveys showing an uptick in racial hostility over the last few years, but I may be dreaming those. i see, i did not think of the recession effects. but also that is only one part of life that can be better or worse, like medicine or war or other things. when you add all of those things up, they make a big difference i think. a funny one is a smartphone. ten years ago there were not many smartphones, the iphone was released in 2007 which is basically ten years. poor people certainly did not have one!! i do not know how much better my life is since i got a smartphone but it feels like it is MUCH nicer to have all the information and music and so many things i want, that is “better”, also now it is accessible to poor people. so are the drugs i take for my heart, so are the cars i drive. As they say, time travel is a luxury for the white man. @Jason Shiga#9- that is the problem with more recent time travel shows like Timeless and Legends of Tomorrow. They acknowledge the injustices suffered by minorities in the past but often they have to hand wave any plot problems that people of color would have traveling before 1970.